The holiday season is upon us! The grocery aisles are lined with Halloween candy and Christmas decorations at the same time. Retailers across the country are gearing up for what hopes to be a better retail season than 2011. One major retailer and client of ours, Wal-Mart, took steps in 2011 to assist their customers in the purchase of items for the holidays. 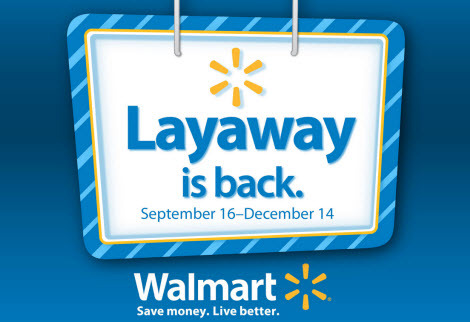 For the second year in a row the nation’s biggest retailer, Wal-Mart Stores, will offer a layaway program for holiday purchases. The company had stopped this program from 2006 to 2010, when the economy was much stronger and shoppers were not in search of delaying payment for gifts. The concept of layaway began in the 1930’s during the Great Depression. In the 1980’s as credit cards became more widely used, the use of layaway decreased. The layaway program allows a consumer to repay the debt for a reserved item over time. The actual item that the consumer shopped for is contained at the store's location and once all payment is made, the item ownership is transferred to the consumer. Wal-Mart brought this retail purchase concept back in the hopes of resurging their sales and in 2010–it worked! Executives cited layway as one of the reasons for strong sales during the 2011 holiday season. This entire concept only affects the store's operations from September to December. After the 25th of December, the items are either purchased and taken home to put under the tree, or returned to the store's normal stock. Wind and Water Tight-Items ranging from clothing to high-end audio and visual home systems are on layaway–these items need to be protected from the elements. Square Footage- Multiple 40 foot containers with 320 square feet of interior space provided the right amount of storage space for Wal-mart's layaway needs. Ground Level Access-Personnel needed to be able to step in and access the stored layaway items for retrieval after completed purchase as well as for inventory checks. Portability-These repurposed shipping containers are movable and stackable allowing them to take up less ground floor footprint. Wal-Mart needed a short-term solution for their inventory and layaway needs. The use of repurposed shipping containers for their holiday rush has been the ideal solution to simplifying their operations. If you have questions, give us a call at 877-704-0177.